It only seems befitting to start off this blog post with those famous words from the Whitney Houston song, “The Greatest Love of All”. Even though this post is not specifically about her those words are perfect for what I have to say. Last night were the 2012 Grammy Awards and me along with millions of others were glued to the TV watching and tweeting our thoughts. I for one thought that the most emotional part of the night would have been the tribute to Whitney Houston. Turns out that what really moved me was singer Adele. Not only is her voice both chilling and stronger than ever after having throat surgery, but her whole presence was amazing. This was Adele’s first performance since having the throat surgery and she didn’t disappoint. She even started off her performance acappella to show us that she’s still got it. But let me get to the real reason for writing this post. I’m not gonna lie, I was so excited for Adele last night for proving that you don’t have to be stick thin to make it in the entertainment world that I had to shut down and stop tweeting altogether. I could not stop the tears. 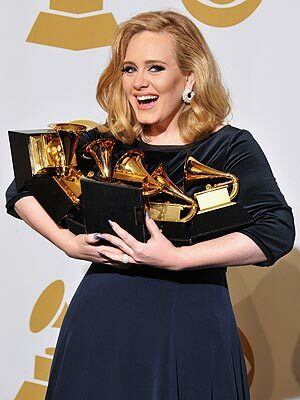 Adele received 6 Grammy’s sweeping the entire awards ceremony last night. 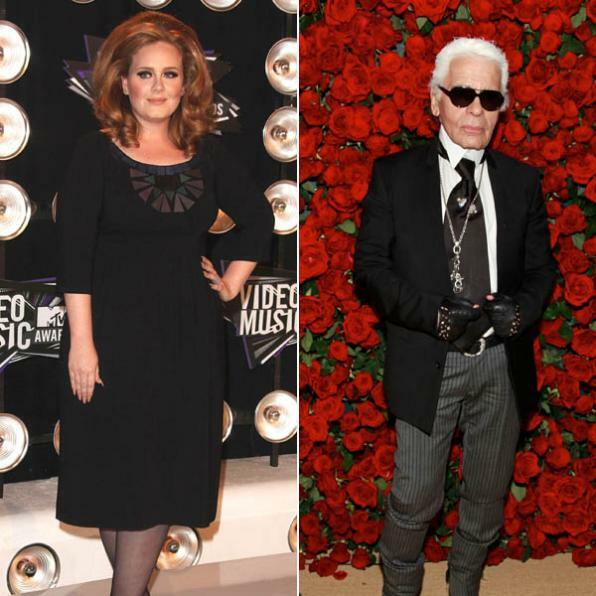 All I could think about was designer Karl Lagerfield’s comments about the singer recently. He said, and I quote, “The thing at the moment is Adele. She is a little too fat, but she has a beautiful face and a divine voice,” the 78-year-old head designer and creative director for Chanel told Metro Paris”. Now this is what pisses me off with society. Everyone is not gonna be shaped the same due to health reasons, genetics, etc. But why do we have to be put in a box because of that? No, I’m not condoning obesity in any way shape or form but just because you may be a size 14 or even a 20 doesn’t mean that you’re not healthy or not taking care of yourself. I’m about to step on some toes here but what the hell. I have been holding this in for some time now. Karl must have forgotten that he was a “big boy” just a few years ago too. Yes, I’m sure some people do feel better about themselves or look wonderful after major weight loss, such as Jennifer Hudson, but don’t forget that you were once larger too. I myself know that I could stand to lose a good 50 pounds but I always want to rep the curvier woman. Even if I do lose the weight I would “never” turn my back on the plus-size world. I honestly have been smaller years ago, when I first found out that I had thyroid problems, and I didn’t look right being 150 pounds. Having a ‘smaller’ frame isn’t for everyone. That’s what pisses me off with society. We feel that you have to be below a size 6 to be ‘accepted’ in the world. That’s what’s been brain washed into our heads for years. Many times producers and industry people tell entertainers that they ‘must’ lose weight or be a certain size in order for records to sell . Ummm, I think last night Adele proved them wrong. ( A point also made with actresses Queen Latifah, Mo’Nique, Amber Riley, KayCee Stroh, etc who have either won awards or made positive strides as plus-size women). It even carries over into the real world of dating guys and also having female friends. Some men only want the ‘society approved’ woman on their arms. I personally have been victim to guys saying that they’d prefer a ‘smaller woman’ or feeling like they only want one thing from you and then not wanna be seen out in public with you. Or have you ever been the ‘fat bestfriend’ who you feel that she only has you around to make herself feel better? Yes, even I have gone through this, recently as a matter of fact, but you know what I do, I just keep myself up even more. Hmmphh, and some of those ‘smaller/society’ chicks can’t even strike a match to me when I step into a room. But let me stop venting because I think you get my point. 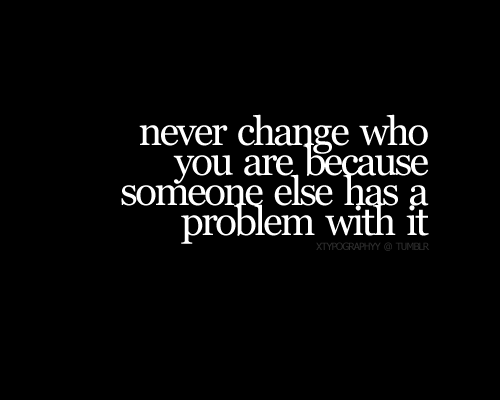 “DON’T EVER LET ANYONE MAKE YOU FEEL LESS THAN. IF YOU CAN’T ACCEPT ME AT MY ‘FULLEST’ (LITERALLY), THEN YOU DAMN SURE DON’T NEED TO BE AROUND ME FOR MY ‘BREAKTHROUGH”. Adele you inspired me and many other curvy women last night. Hats off to you! Now since I am a fashion stylist I must speak on the styling point of view. Although Adele looked great in all of her outfit changes last night, I think her stylist played it too safe with the basic ‘black’ looks. Earlier in the night I inadvertently tweeted that “Adele was wearing all black AGAIN, smh”, but I was getting her confused with Melissa McCarthy. But that just proves the same point, why are these beautiful women hiding behind black so much? 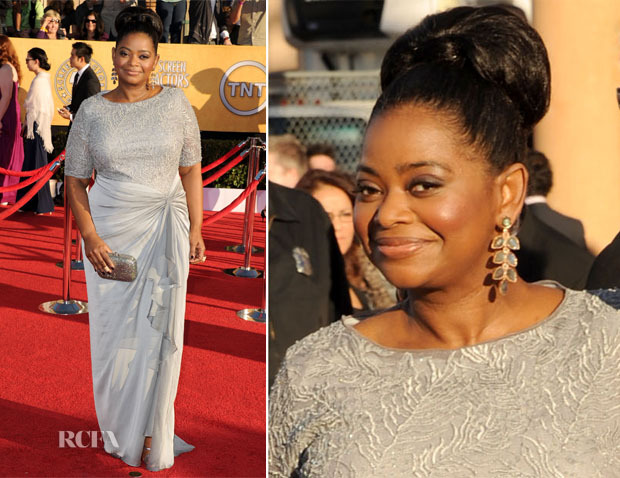 Golden Globe and SAG winner Octavia Spencer has demonstrated that women with curves ‘can’ rock colors and look marvelous while doing so. 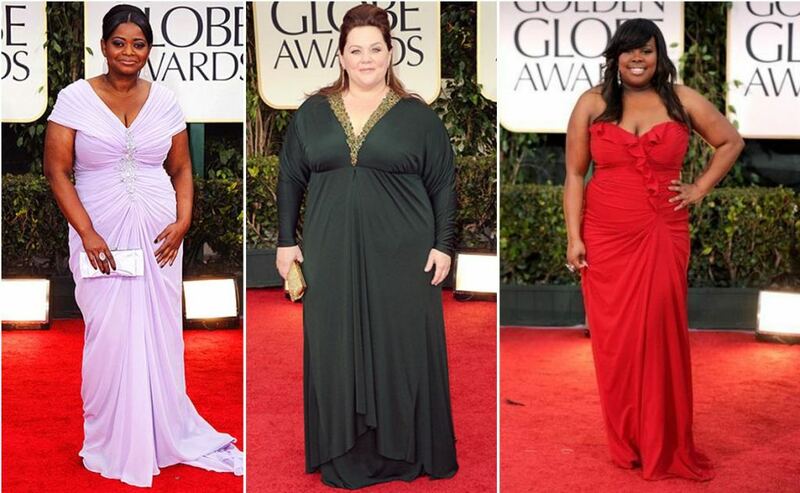 Her designer of choice right now is Tadashi Shoji and he’s been making fabulous color-flattering pieces for her. So go ahead ladies, rock your curves!